Song writing Articles to boost your music writing career: "You've written a Hit song... Now what?" "You've written a Hit song... Now what?" So you're a songwriter, you've written a Hit song... Now what? Recently a great pal issued me a challenge: "DEC, I'll become a Member of your 'Serious Writers Guild', write a Hit song, you do the demo and make it a Hit...."
"WHHHHOOOOOHHHHHH! Hold up there Stuart! Do you realise what's involved in making a tune a Hit?" "Nope! You just make a few phone calls, don't you?" "Stuart, if it was that simple then the world would be full of song writing millionaires with recording contracts coming out of their ears and platinum discs lining their walls instead of wallpaper. OK, Stuart, let's start at the beginning...write me the Hit song"
"Oh, I've got one I wrote a few years ago that will do." "THAT WILL DO!????? Do you realise that the feel, sentiment, dancibility, mood, metre of Hit Tunes changed by the month? A two year old song is as good as being twenty years old!" "DEC, it's only a bet!" "Yeah, and four weeks out of my life!......send it to me"
It arrived, you guessed it, a dated, 'Moon in June', 'I'll love you till the end' song that just went nowhere, did nothing and just bored the a** off me. "I'll ring up a couple of my pals". They came over. I had started work on it...trying at least to get the chord structure more 'today' and simpler (amateurs always make the mistake of including too many chord changes). I tried to concentrate on '2' chords, in other words a ninth but played as a 'two'...got it? Sounds great on acoustic guitar....which I now wanted to focus on. Doesn't work, has never worked and WILL never work...a total waste of time and money...TRUST ME! NB: in a professional world no matter what you think of the TOON give it your best shot...it could end up in the next James Bond Film! I knew Mark wouldn't 'hack it' for the lead vocal by his 'attitude' toward the song but then, I knew that David was 'up for it' in a big way. I then wrote the harmonies, for the complicated stuff and we 'winged' the unisons, octaves and triple octaves (I'm giving my secrets away now) just like I advise in detail on my 'How To Make A $Million From your Music' award winning main course. We used twelve tracks of back vocals all through Roland RSS which made them more pronounced left and right and also effectively doubled the density of the back vocals...so now we were up to 24 tracks. Of course the 'impossible to sing' bits I did...then you can't beat a guy of my experience...although I prefer young voices because of that indefinable modern 'feel'. I get the notes right but the feel? Do you do all that with your tunes? I asked David over the next day, got string ideas from him, which I fleshed out when he left (again you can't beat thirty years experience of hit arranging and production). You see, a producer like me can just listen and pick up on brilliant passages as the guy is just trying lines out.....that's what a great producer does. NEVER GO NEAR A STUDIO WITHOUT A GREAT PRODUCER! Then he asked me....."Oh DEC, any chance I can do a lead vocal, I've got all these ideas and lines in my head...please....I can do it much better than Mark"...That's what I wanted to hear....WOW! I produced his vocal, carefully extracting the best from what he was giving me, improving it...moulding it, glossing it, till we had a gob-smacking vocal....and that's how you make a hit record! Then the glossing of the music....I then extracted the best lines for acoustic guitar....put on two acoustics intertwined so they sound like one....every guitar player will wonder how it was done...now you know! I made sure it was presented in great stereo left right....then great drum programming. We worked up to now with a good drum track, now came the time to make it fantastic. I was going to use a fantastic live drummer (all of sixteen and female) but the programming sat so well there didn't seem any way it would improve the track. And an R&B feel can easily be destroyed by a live drummer...trust me on that...and sorry to the drummers reading! So now a mediocre, old time ballad has been turned into a top three tune with a great R&B undertone....Mixed it, then went to my favourite mastering studio to master it (do not ever think a record is finished until you have had it INDEPENDENTLY mastered...again do not attempt this yourself! ).....Then I sent it to Stuart...remember Stuart? You, my friend , are a master magician. I could not believe the brilliant job you did on the track and it certainly made the wait worthwhile. Unbelievable. I've played the track to a dozen people ranging from 12 to 60 and the all LOVE it. Unprompted they all say something like: "That's a Number One Hit"
Bottom line - tell me what to do next. >>>>Thank you for your kind comments. This, of necessity, has to be a bit long and needs a lot of reading and thought! So settle down. Four ways of approaching this matter of having a 'Hit Potential' song. Each way valid and each way necessitating hard work. Record Companies are not in the business of finding songs (contrary to much held belief). They, generally speaking, sign artistes who have either written their own songs or their management have access to great current, respected writers with track records (usually past Hit recording artistes themselves). If a Record Company does fancy an artiste who does not fit in with the above then the Company will call first to their affiliated Publishing Company, who in turn will have a catalogue of, not only new songs from their roster of writers, but old stuff that is ripe for re recording (Steps? Celine Dion? Phatts and Small?). The 'Modus Operandi' of exciting a Record Company is precisely the same as for the other three 'approaches'. My way, and the way that the 'insiders' use and will not share with the 'amateurs'. We'll get to that in a minute. Why? Because they are inundated with CRAP! Every amateur has a CD burned and trots it off to Robbie Williams with twelve songs on, ranging in age from six months old to six years old and all sounding fifteen years to twenty five years old. Forgetting that Robbie writes himself/writes with astonishing co-writers/has twenty top writers calling him with great songs that he can 'have a bit of the action' and lastly has 200 Music Companies pestering his management Company with great and almost great songs. So the 600 demos that arrive per week? You can answer that yourself! Celine Dion, at this moment in time, has a backlog of demos that fill up the next six months of listening time! Why? The Record Companies want Hits. They get Hits more easily with New Product...in other words a 'project' which is: the song and the artiste/artistes. Artistes today are almost like cannon fodder. It's the song that is the hit, the artiste is merely the convenient vehicle. This is, by far the most 'used' method in our business....because IT WORKS! Nobody in the Company, thus, has to worry about the peripheral stuff...IT'S DONE FOR THEM. Yes, they will automatically want the track remixed...that's a given...and still a mystery of the Universe to producers like me...the new mix is never 'better' than the original, unless produced by the original producer (on phenomenally expensive gear at the Record Company's expense). Might as well sell it to The Ford Motor Company. Of course, they will sign you up (you make no money). Unless they feel you are an exceptional talent both writing wise and performing wise then you may get an advance and maybe, if you're lucky, a better percentage split than normal. But we all know, and choose to forget, that advances have to be paid back out of royalties...so you're still not making money. Of course, they will tell you you have a wonderful song, and can they have some more (you make no money). Then, if you sign, you are in the queue behind the 800 other writers with material on their books. And the 35,000 titles they own and they are trying to make money from...PLUS their top writers who consistently turn out TOP THREE tunes. Who do you consider gets the most attention? Got it in one! As an overview let me say one thing: sending hundreds of demos DOES NOT WORK...Never has done, never will! That's not how we do it! AMATEUR IN THE EXTREME. We sell by enthusiasm. In other words, an intelligent, exciting, enthusiastic, crazy business letter. The top guys in all Record Companies /Publishing Companies /Management Companies are all Business Men...simple? Before committing to anything, they need to know that there is more to come (they would typically spend £1Mill. on a single with the idea of a follow up album, that's where the big bucks are). The Robson and Jerome 'I Believe' promotion was reputed to cost £4 Mill. The Christmas album on the back of it made a tidy Fortune. I had the original million selling hit with 'I Believe'. A 'today' record company would have very little interest in what is called a 'flyer', in other words a 'one off' Hit with no follow up. "Dem days are gone!" Fortunately, David, Abbi and Mark are current phenomenal writers who can take their own or YOUR start points and turn them into HITS. They also are stunning on stage. And just ripe to be plucked. The hard work is in tracking down the heads of A&R of Companies who deal in this type of material, getting a name and an address (yes, there are reference books but A&R people typically change each six months), then the letter, a follow up letter (they are usually the most disorganized people in the world). It is more than useless trying to call by phone and forget about e.mail and recorded delivery. At the end of the day it is a 'numbers' game. Even with 'clout' in our business these guys are inundated by propositions, projects, songs, artistes...up to their eyes in it! It is the ultimate 'cry wolf' scenario....they have been 'conned' by so many managers, producers, agents that they just do not believe anyone anymore.....I CERTAINLY DON'T!!!!! Did I believe you? Any one of (A), (B), (C) actioned by a gobsmacking sales letter and a ruthless campaign entailing a heap of hard work....forget about (D). A shedload of money, a lot of fame and dozens of managements, Record Companies, Artistes wanting more product! In the case of (C) a money printing machine (you can see why this is the most attractive route). You have to move fast. Material and taste in our game changes every three months. Your song: 'Another....Broken Heart' is current now, but in a few months? A lot to take in Stuart....read this letter, digest it and then make an informed decision....I am always here......as you now understand it is not a game of just a few phones calls!!!!! I have, in this letter, given you what most writers would give their right arm for....the way to have success with their song! The way WE do it. "Where the lil' guy gets the same chance as the big guy!" When you get involved with DEC you get the first program: "How To Make A $Million From your Music" - ten months of two knowledge packed program releases a month, stunning advice, today's methods for writing music, making music and promoting it. 24/7 access to the man himself. And you get a 'LIFETIME' guarantee. 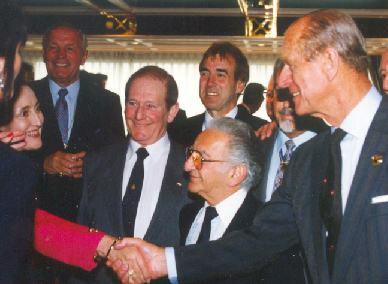 "Dec [center rear] and his pals: Henry Cooper, Jim Marshall (yes, THE Marshall man), Davy Kaye and His Royal Highness Prince Philip help, yet again, with Stella Vaughan, Frankie's widow"
Dec always says: "hang your hat on a good, honest charity, your help will be returned a thousand times"
Copyright © 2000 - 2009 The Serious Writers Guild. All rights reserved.